Unfortunately and with great regret, I never learned a great deal about "Jim". When I had reached the age of awareness, probably five or six years of age, Jim was probably in his late forties. Jim was married to Wyona Hunt whose parents lived in the Meadow to Lemmon area. Wyona was a chubby, very red haired, and freckled woman who's sole interest in life was probably her husband and children. The James Shockley children, from oldest to youngest, as I recall were Dora Lee, and several years her Junior were Joseph, Jenny Lee, and then Willis. Dora Lee, the oldest child was about four years younger than I, when they lived on the first farm that I was aware of, around Coal Springs. I stayed with them sometimes and Dora Lee used to follow me around like a pet. She was a sweet girl and we have stayed in touch to this day. About the time she graduated from high school in Lemmon, she married Marlin Gaskjolin and they lived on a farm South of Lemmon until his death a couple of years ago. Since I was considerably older than Joseph, Joey as he was called, we had very little in common. The next daughter, Aldene, a very sweet and pretty child, was very personable and bright. I lost track of her completely after I graduated from high school. She was killed in an auto accident when on her way to take her exams for her Registered Nurse degree, her car left the road and she was killed. The next girl , Jenny Lee, is married and lives in Nebraska. She and her husband visit the Lemmon area often. Editor's Note—James Shockley was John Crowley's uncle, the brother of his mother, Mayme, who was married to Thomas Crowley. The Crowleys and Shockleys had migrated to the Thunder Butte area from Lake Williams, North Dakota, where James' and Mayme's parents had put down roots after relocating from Wisconsin. 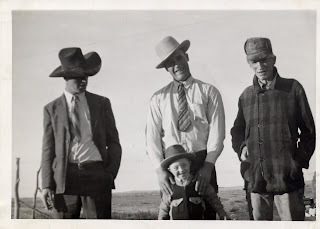 This photo shows brothers Joseph and Neal Crowley along with their father, Thomas, and their sister Cece's boy, Tommie, at the family home near Thunder Butte shortly before much of the family moved to California. This picture would have been taken in the late 1930s or perhaps 1940. Joe and Neal are all dressed up, perhaps for church. My guess is that the family (or some members of the family) was about to set out for church in Glad Valley. How long can a mountain last? Always terrify the dumb and mute?